Heading out on a backcountry skiing or snowboarding trip requires preparation. That involves checking the weather forecast and avalanche bulletin, making a trip plan, letting people know where you’re going and when you’ll be back, and packing all the essential gear. How much stuff to fill your pack with is often a personal preference, which is why we’ve broken down our “essentials” list into three categories 1. survival (must haves), 2. convenience (nice-to-haves) and 3. luxuries (could do without, but makes the trip more enjoyable). 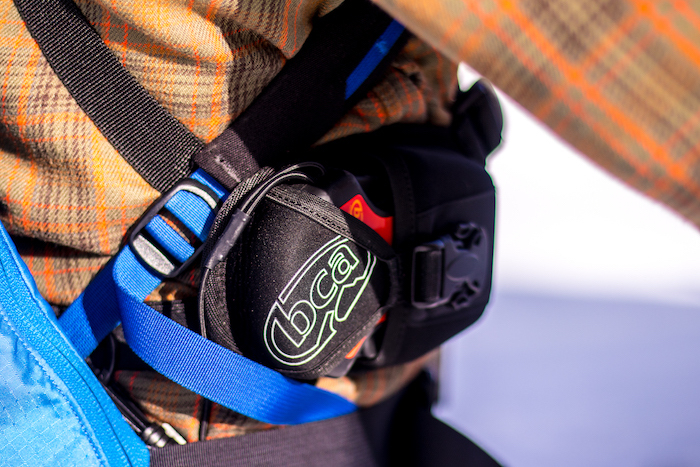 So now let’s take a closer look at the essentials to pack on any backcountry skiing or snowboarding trip. Sidenote: “backcountry skiing and snowboarding” is such a long phrase. 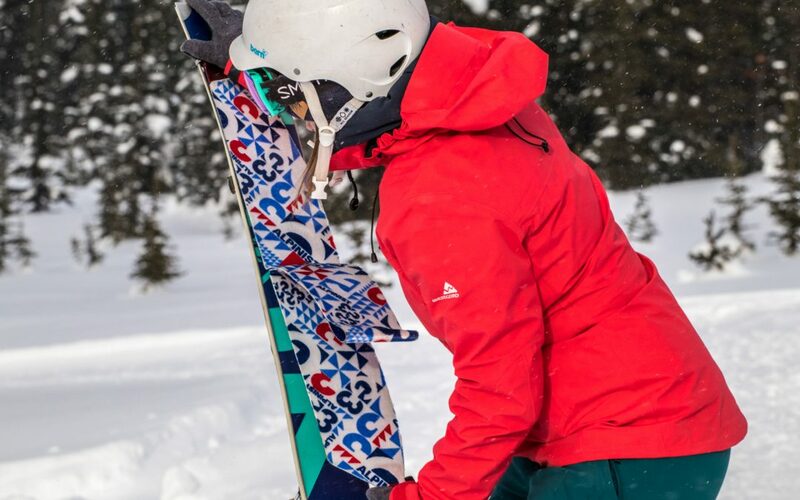 So in this post we’re going to just say “backcountry skiing” but we recommend all of these items for both skiiers and snowboarders. These items should always be in your pack for a backcountry trip. Your survival (and that of your friends) may depend on it. Without this electronic device, you can’t find your friends in an avalanche or be found in an avalanche. Make sure your transceiver is up to date with three antennae and a mark function and you have practised with it sufficiently. Always replace with fresh batteries at the start of the season and remove the batteries over the summer to prevent corrosion. Used to pinpoint buried avalanche victims. Know how to deploy your probe quickly and how to search a grid with it efficiently. In regions with deep snowpacks, opt for a probe 300cm long. Great for building jumps, but most importantly is used to excavate avalanche victims after striking them with a probe. Look for a shovel with a metal blade and sturdy construction. 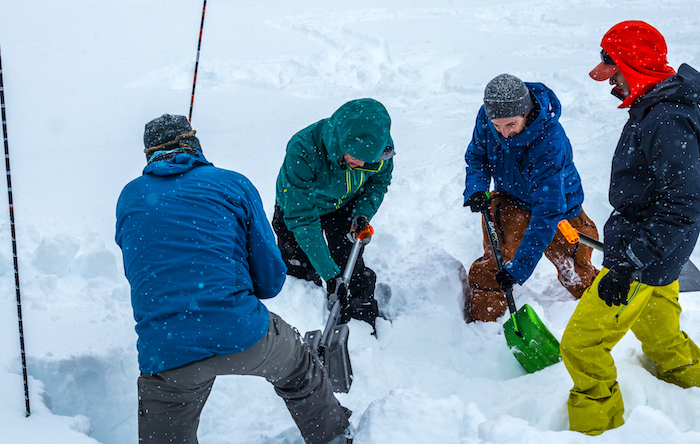 A shovel can also help you dig an emergency snow cave or be used as a snow anchor in a pinch. Hydration is paramount for any activity and sources can be scarce in the backcountry. Make sure to pack a minimum 1L bottle for a day, preferably a sturdy construction such as a Nalgene. The classic wide mouth bottle lets you add snow throughout the day to top up your water level. Avoid bladders and hoses as they will inevitably freeze. 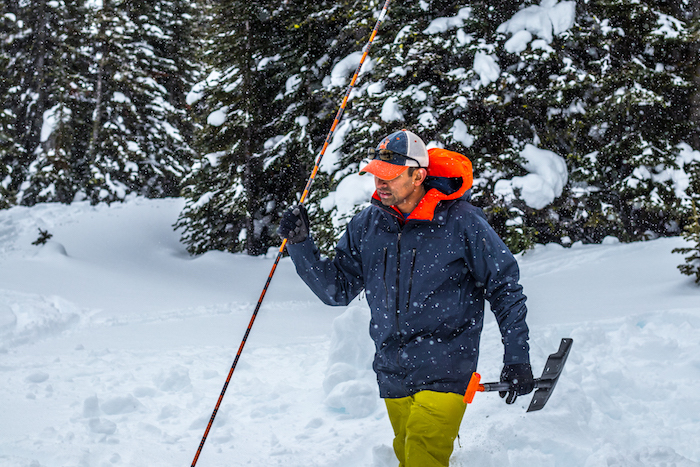 In addition to your base layers, insulation layers and a waterproof shell, packing an extra layer or two in case of emergencies is good practice, especially if you have to spend the night out in the wilderness. For the aforementioned emergency night out, having a reflective space blanket or lightweight emergency shelter stowed in the bottom of your pack can be a lifesaver. You may never have to use it, but if and when the time comes, you’ll be ready. These come in all manner of size and level of disaster preparedness. Choose one that fits the type of trip you intend to embark on. 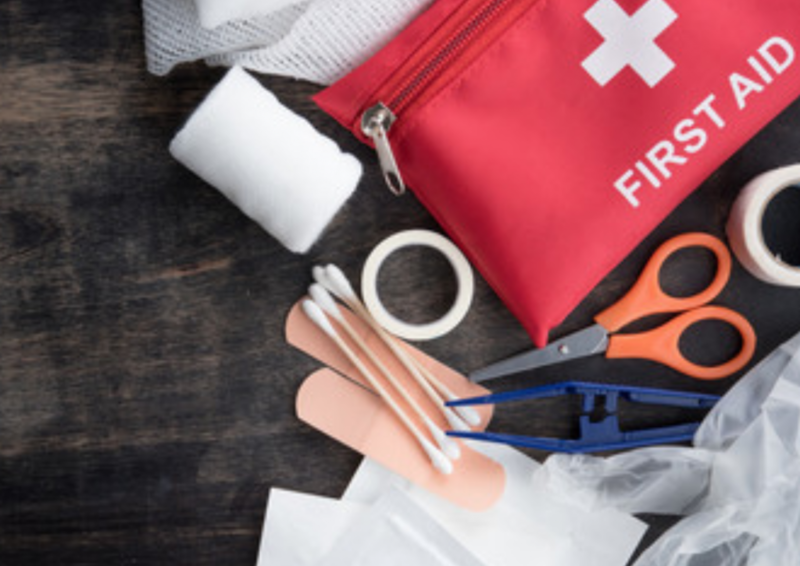 For example, a 1-2 day trip can be just the bandaging essentials whereas a 4-5 day trip could use a few larger items that will fit in your larger pack. You may intend to be back to the car before it gets dark, but it doesn’t always work out that way. Have a headlamp ready with fresh or near-fresh batteries and you’ll have a much easier time getting home past nightfall. Preparation means knowing your route ahead of time but also getting back on track when you take a wrong turn. You may not be in service the whole time, but it’s worth having your phone to contact authorities/next of kin as soon as possible when you take longer than expected in the backcountry. An emergency overnight will be much more comfortable if you can get a fire going. These small packets can sit at the bottom of your pack next to the emergency shelter and First Aid Kit. You can get through the trip without these items, but having them makes it a smoother experience. Tighten your binding screws. Cut loose that piece of flapping base material. Saw down that sapling to make a shelter. The uses for a multi-tool far eclipse the added weight of stainless steel in the pack. For more emergency binding and fixing. No need to take the whole roll, you can store an emergency amount by wrapping some around your ski pole or water bottle. Nalgene water bottles work really well for this. Communication is paramount in the backcountry. If you intend to split the group or wander out of earshot, it’s worth having these handy communicators. These items can wet easily and may not dry until the end of the trip. Have spares and your head and hands will thank you. Like using your phone to take photos all day? It’s worth having a mobile charger and cable with you in case you need your phone to put in the call for help. If you’re taking a multi-day backcountry ski trip always bring extra batteries for your transceiver and for your headlamp. Most transceivers and headlamps will use the same AAA batteries so you shouldn’t have to double up. Always check the battery charge of your transceiver every day before heading out. A good golden rule is to always replace your transceiver batteries when they get to 70% or less. The most effective way to alert authorities that you require rescue when out of cell range. This will give you peace of mind when entering the wilderness for extended periods and a relatively quick response should things go wrong. You don’t need these, but they’re nice to have along. Tea, hot chocolate or coffee? Having a Thermos on a cold day is a great way to warm up and stay hydrated. Best to keep your phone charged for emergencies and a real camera takes better photos anyway. Something compact and lightweight will do the trick. Makes sitting down for breaks all the more pleasant. Lightweight too! This list is by no means exhaustive and may not be practical for every sort of backcountry ski or snowboarding trip. Always make sure your party has the skills and knowledge for self-rescue when venturing into avalanche terrain. If all of this is a little overwhelming, don’t worry. We all started somewhere. Take a look at our Intro to Alpine Touring 101 program that was purposefully built for introducing beginners to backcountry skiing and snowboarding in a safe, fun and fully guided experience.